The first winds of hurricane Dean are starting to blow in Cancun. After Wilma barreled Cancun in Oktober, 2005 I thought we were cleared for the next fifteen years or so . I mean, what's the chance of such phenomenon hitting the same exact spot twice in two years? Apparently no-one in town is taking the risk to find out. Starting last thursday or as early as wednesday last week (which also happened to be 'quincena', that's when people get paid their two-weekly salary so there's money to spend and boy, do they ever...) the local Wal-Marts are packed with people buying provisions, just in case. Tipically, on friday there was no bread left, no tortillas and no batteries, only empty shelves. But shops are being supplied constantly, so it could actually be better to wait until the last day, when everybody else has already done his or her shopping. The good thing about hurricane Dean is that he's male. Guys, don't take offense, but aren't men supposed to be energetic and impatient? So like Gilberto in '88, we can expect hurricane Dean to be a one-night-stand. It will probably be over in about 8 hours. Wilma on the other hand was a lady. And we ladies like to linger, don't we? So instead of moving along, Wilma stayed over 60 hours to enjoy Cancuns beaches (and blow them away in the process). Since Wilma I've been telling myself to go and buy some boards to cover the front windows. Of course I never actually went out to buy them. So now hurricane Dean's on its way lucky me had to stand in line for hours at the Home Depot. Not to mention many local wood outlets that not doubled but tripled their prices. One man's need... Finally my turn came and I managed to purchase my boards. Boy, was I in need of a foot massage! 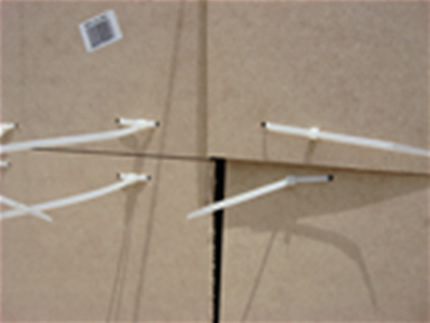 buy thin (3mm) board and then fix it to your window protectors with plastic cable organizers. See? No need for drilling holes or nailing the stuff. Now see if it holds tonight! Hurricane Dean, you're very mean, but I'm not scared cause I'm well prepared! (Um, poetry was never my strongest subject). When there's a storm coming, like hurricane Dean today, alarm is given by the authorities and a contingency plan is executed. Of course nobody wants his vacation interrupted by a phenomenon like this but if you follow the instructions there's nothing to worry about. At most hotels people will be evacuated to hurricane shelters (hotels away from the beach, schools, military quarters) until the storm is over. Some hotels are now certified as a so-called auto-shelter, like the Moon Palace in Cancun. Since yesterday, Moon Palace is receiving 5,000 guests from all the Palace hotels on the Mayan Riviera. They will stay at the Moon where all is prepared to keep these people safe and secure while also guaranteeing their comfort. Authorities strive to have a number of these certified hurricane shelters along the Riviera Maya. Hurricanes occur in the Atlantic, Pacific and Indian oceans but they need warm water (79F, 26C) that fuels them. This limits their appearance to the warmest regions like the Caribbean, Phillipines and Indonesia (where they are called typhoons). The birthplace for Atlantic hurricanes is normally off the West coast of Africa, in the Eastern part of the Atlantic. From there they start travelling west to end up in the Caribbean region, leaching on evaporation. In Cancun and the Mexican Caribbean coast, these storms happen between June through November, the warmest and most humid months of the year and also the Rainy season. According to the latest news, the eye is probably going to hit somewhere near Felipe Carillo Puerto, which means the area most affected will be to the south of Tulum down to Chetumal and Belize. I'm sorry for the people down south, but also relieved that this time it won't be a full blow to Cancun again!